Archaeoastronomy is one of my great interests. I am honoured to have been elected as a full member to ISAAC, the International Society for Archaeoastronomy and Astronomy in Culture. Consequently I was fascinated to read of new ideas about one of the most fascinating sites in the world, Gobekli Tepe in Turkey. But new ideas need checking, as one of the archaeologists I trust most, Jens Nortoff, points out below. 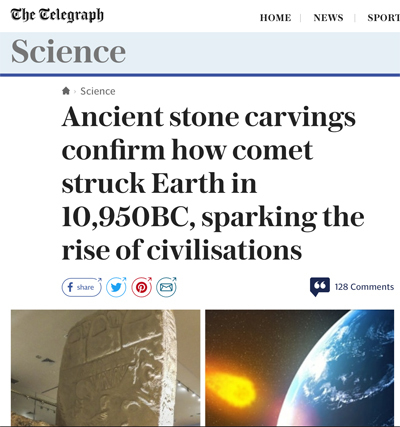 As someone who has put a new idea about archaeological interpretation knows, this will all take time and debate – as it should be. 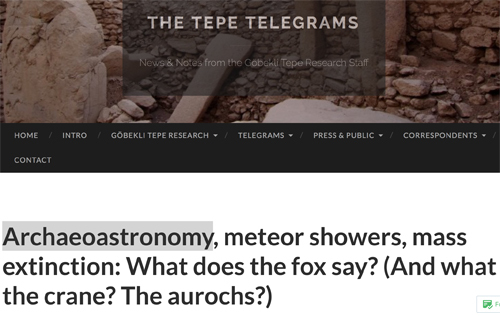 The full academic article can be found here: Martin B. Sweatman and Dimitrios Tsikritsis, Deconding Gobekli Tepe with archaeoastronomy: what does the fox say? Odd things about this report concerned me, but I am not in a position to judge without a great deal further investigation. So I went straight to the authority I respect most on Golbekli Tepe, Jens Nortoff at The Tepe Telegrams. These reports are from the archaeologists in the trenches. A selection of the carved reliefs found on many of Göbekli Tepe’s T-shaped pillars is linked to and interpreted as depiction of actual stellar constellations. In particular Pillar 43, which is indeed an outstanding (but actually not exceptional) example of the site’s rich and complex iconography, is interpreted as record of a meteor shower and collision – with quite serious consequences for life on earth 13,000 – 12,000 years ago (this whole ‘Younger Dryas Impact’ hypothesis [external link] actually is disputed itself [external link], so making Göbekli Tepe a ‘smoking gun’ in this argument should absolutely ask for a closer look). This is the stunning pillar in question from The Tepe Telegrams post. 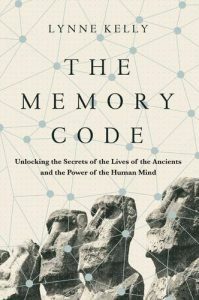 Anyone familiar with my work will now know why I find Gobekli Tepe so intriguing. 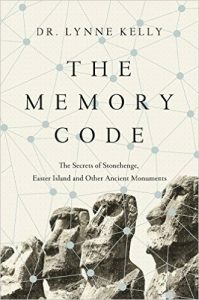 As someone who has published a new theory for the purpose of sites such as Gobekli Tepe, Stonehenge and many others, it may be assumed that I would automatically be attracted to, and supportive of, other radical new ideas. I am. But I am also hugely respectful of the views of the archaeologists who know the details of what has actually been found there. 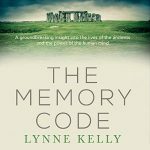 Consequently, it was hugely important for me to ensure that my theory was consistent with all the archaeology reported from the field. It was then an imperative to present the ideas to relevant archaeologists, as I did in the UK in February and listen to their concerns. I was delighted that there was no objection to the theory. It is now a matter for debate of the details. That will refine the theory. Getting into the academic debate is the first step. For that reason, I congratulate Dr Martin Sweatman and the Edinburgh researchers for their work and for raising awareness of this incredible site. This entry was posted in archaeoastronomy, archaeology, Gobekli Tepe, stone circles and tagged archaeoastronomy, archaeology, astronomy, Gobekli Tepe. Bookmark the permalink. Thank you, Edmond. A quick skim look very interesting. I shall have a more thorough look very soon! Dear Lynne, you might be interested to know the site’s archaeologists have responded to our work , and we have responded to them in turn, in volume 17 , issue 2 of the same journal. Thank you so much, Martin. I shall get a copy through my university and read it with interest. All the best with the debate. New ideas are a hard task to get taken seriously, let alone debated.